Summer is officially history, but Amish auctions plow on into October. 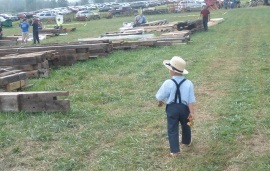 Looking for dad at the Beaver Run School Auction, Danville, Pennsylvania. Below you’ll find listings for quilt and craft sales, consignment auctions, a Haiti sale, a downsizing auction, and a fire company mud sale, perhaps the last of the year. States include Illinois, Pennsylvania, Wisconsin, Delaware, Iowa, Ohio, Kentucky, Missouri, and Tennessee. We’ve also got some non-auction events listed – fire company breakfasts, a book signing, and the “Charm Days” festival. As always, a special thanks goes to our auction list compiler for her hard work. All photos on this page: Beaver Run School Auction, Danville, PA, taken by Jerry. Oct. 1, Wed. – Miller Downsizing Auction, Burton, OH, 4:30 p.m. Geauga County. 17201 Mumford Rd. Burton, Ohio 44021 Farm machinery, horses, household items. Oct. 3, Fri. – Gingerich Auction, Peebles, Ohio, Adams County. Farm equipment, tack and harness, livestock and household goods. Oct. 4, Sat. 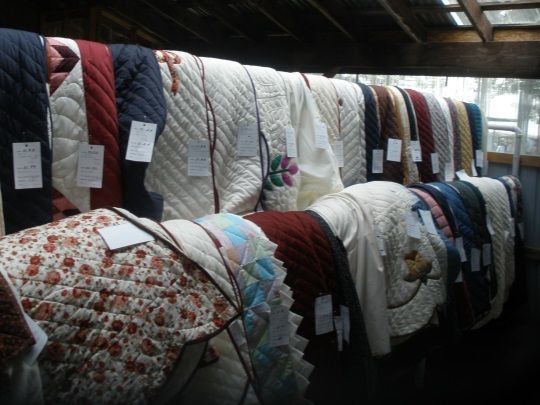 – 59th Amish Quilt Auction, 10 am. Scott Township Volunteer Fire Department (new location), 3712 Harlansburg Rd. (Rt 108), New Castle, PA. Held October and April. Over 150 quilts for sale. Oct. 4, Sat. – Annual Fall Quilt and Craft Sale, Strasburg Fall Consignment & Mud Sale, Strasburg Fire Company, 203 Franklin St., Strasburg, PA. 8 am. Oct. 4, Sat. – Gratz Fall Consignments Auction, 6th Annual Amish Parochial Schools Of Lower Northumberland County Consignment Mud Sale, 601 E. Market St., Rte 25, Gratz, PA.
Oct. 4, Sat. – Benefit Consignment Auction, 10 am at Whitewater Truss Company, 79 Paul Foulke Pkwy., Hagerstown, IN, to benefit families in Wayne County with large hospital bills. Two very different types of plants in this photo. Oct. 10, Fri. – Annual DDC Clinic Benefit Auction, for special needs children, Middlefield, OH. Oct. 10-11, Fri. eve. & Sat. – Galilean Home Ministries 25th Annual Quilt & Craft Auction, Liberty, KY. All proceeds benefit the children. 606-787-5120, www.galileanhome.org Fri. 5 pm ET. Spaghetti supper, Sat. 7 am ET Pancake Breakfast, auction begins 10 am ET. Oct. 17 & 18, Fri. & Sat., – Annual Fall Carriage Auction at Lebanon Fairgrounds, 80 Rocherty Rd., Lebanon, PA 17042. Martin Aucts. AY000144L. Horse-drawn Coaches, carriages, sleighs, harness, saddles, tack. No quilts or furniture. Oct. 18, Sat. – 30th Annual Amish Parochial School Auction, 8 a.m., 764 Winding Creek Rd., Dover, Delaware. Oct. 18, Sat. – Fall Consignment Auction, 10 am. At the Casey County Produce Auction at 524 South Fork Creek Road, Liberty, KY. This consignment auction occurs every third Saturday in October. 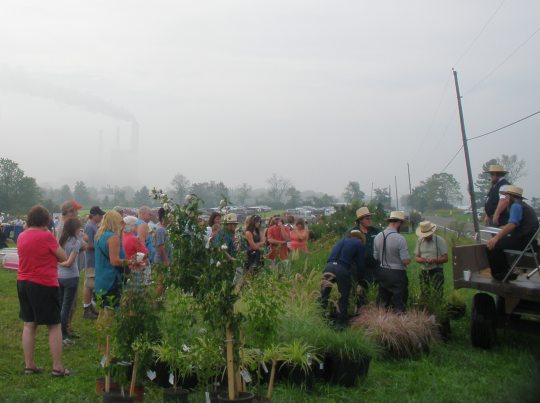 Amish and Mennonite participation. 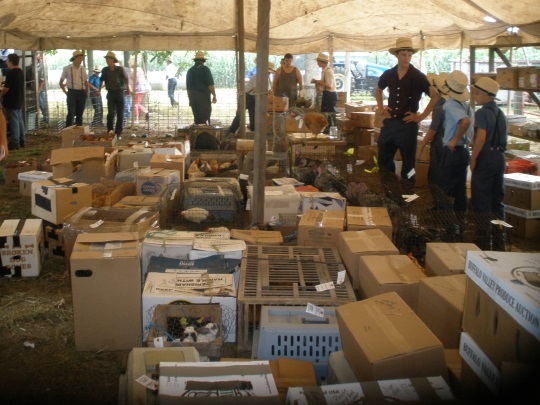 Livestock, poultry, farming equipment, household items, horse tack, some quilts and furniture. Oct. 18, Sat. – Gap fire Company supper http://www.gapfire.org/ Fall Ham and Oyster Supper, Gap, PA.
Oct. 18, Sat. – Christiana fire company breakfast, 6-10 a.m., Christiana, PA.
Small Animal Sale at the Beaver Run School Auction, Danville, PA.
Oct. 22, Wed. – Fall Consignment Auction, 2347 Dell Road, Cashton, Wisconsin. Oct. 22, Wed. – Donald Kraybill book signing, at Shady Maple, East Earl, PA, by reservation. Oct. 24-25, Fri. evening and Sat. – 21st Annual Illinois Haiti Benefit Auction- Otto Center, ½ mile south of Arthur, Illinois. Friday evening meal from 4:30 to 7:30 pm. Oct. 25, Sat. – Cochranville Fire Company Mud Sale. Cochranville Volunteer Fire Company, 3135 Limestone Road, Cochranville, PA 19330, 610-593-5800. Consignment Auction in Casey County, Ky. While this comment isn’t auction related, I wanted to say a big thank you to all the information you provide. I came across your posts when searching to see if there were any Amish communities in NC. We visited the sole community in Union Grove recently. We bought items from the store, enjoyed ice cream from the dairy, and saw their school and church building. I hope to visit the states that are home to more communities, but this was indeed a highlight for me! I am a Tarheel grad and love our state, just wish we had more Amish. I have a true respect and admiration for them. Thank you Kim, on behalf of our contributors as well. I am in NC as well, am hoping to make Union Grove one of my first Amish visits this year. I was there about three years ago. Good point 🙂 I left off the address. Added it above, family is Henry and Sadie Miller. Kim’s giggle made me visualize the Millers shedding pounds and going down to a smaller size of clothes, or downsizing. Now the Yoders are downsizing! I’ll see if my pen pal in Geauga County knows of those in her area. 21st Annual Illinois Haiti Benefit Auction. If you have 13 minutes, it’s worth watching this video from 2014. Can anyone help find a piece of the auction puzzle? In Ohio in past years, a Benefit Auction and Haystack Supper for Beacon Hill was held in October. Will an auction be held in 2014? The Amish community in Clarita, Oklahoma has their school auction the second Saturday in September. I’ve gone the last 3 years, it’s great. They have the best cinnamon rolls and I would love to someday be able to afford one of the quilts. On Saturday, October 25, 2014, the 14th Annual Bethel Mennonite School Fall Festival and Benefit Auction will be held at the school grounds at 5946 Brookneal Highway, Gladys, Virginia. Crafts and apple butter on sale all day. This is always a nice festival, and the drive is a pretty one this time of year, as it is kind of up towards the foothills. The bbq chicken is great, as is the apple butter and baked goods. I will note that in my experience, they TRY to start auctioning the quilts around 1, but it may be a bit late…. This event usually draws a good crowd, but they have plenty of parking. Hope to see you there. The Grabers are having an auction in Hillpoint, Wisconsin, to sell farm and shop tools, hickory lumber, and household items. At the Oct. 11 Quilt Auction in Jamesport, Missouri, the highest quilt sold for $2,350. Quilts were sold from 9-4:30. Most were hand quilted. About 300 quilts were sold. They have a quilt show on Thursday where people can vote for the best quilt, a quilt viewing on Friday, and the auction on Saturday. The quilt that was voted to be the best quilt of the show, a Dreamscape pattern, was the one that sold for the most money. The top dollar Dreamscape was black, white, yellow, and cream colored.